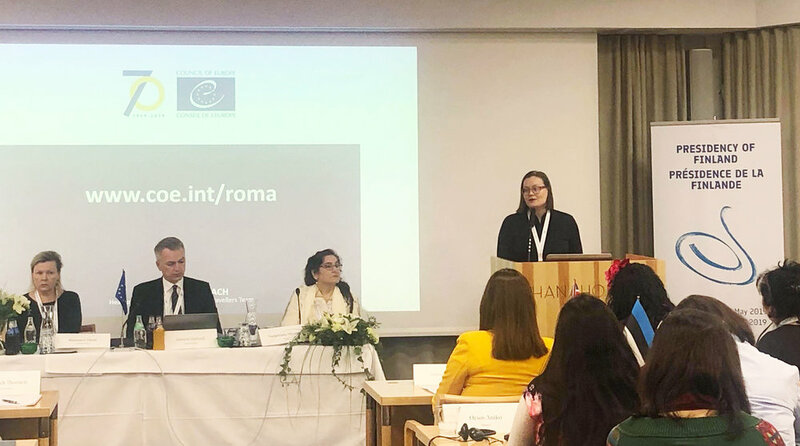 My speech at the 7th International Roma Women’s Conference organised under the Finnish Presidency of the Committee of the Ministers of the Council of Europe. My headline today reads The importance of the Feminist party for minorities and roma women. It includes a bold statement – that we are important. A political party has very little importance to any minorities unless those minorities are fully represented in the party. And not just represented, but included in the political decision-making within the party. Every people and every group has a voice. Nevertheless, within our political field, some voices are more amplified than others. To truly embrace equality, all voices need to be heard. In this sense, we at the Feminist party still have a long way to go, just as all political parties do in Finland. However, we have a vision. A vision that we are committed to. Our vision is a society defined by freedom and love. We believe that no-one can be free if all of us are not free. Our vision is a society that is an equal society, and does not leave anyone behind. We believe there are a multitude of means to achieve this goal that have not yet been used. This has to do with what feminism is today. Modern day feminism is based on an understanding that many of us can be privileged in some positions, and yet oppressed in others. On the one hand one might suffer from oppression because of their ethnic background, or skin color. And on the other hand because of one’s gender. This many of you know first hand. Whether you are a roma woman, a disabled man, or if you are a transperson or do not define yourself in either one of the gender binaries, modern day feminism includes everyone. Thus, our goal is to amplify the voices of those who have long been silenced. on the level of the European Union, no other group faces the kind of silencing and discrimination as the roma people do in several European countries. And this concerns Finnish society, too. I believe that in Finland there are two minorities that have especially suffered from this silencing: the roma and the sámi people. Thus, roma people need to be included in the decision making. Because equality can only exist when the silencing has ended and everyone’s voice can be heard loud and clear. I started by stating, that we in the Feminist party also need to look critically at how well our vision works within our own party. I have felt frustrated and disappointed that we were not able to secure roma candidates in the upcoming parliamentary election in Finland, even though we tried. But I believe this is a structural issue – it would be easier to represent us, if roma women already had visible roles in our party. This is what we need to work on now. And in two years time, I hope that we will be able to sign the first roma candidates on our list and see roma women represented in our party board as well. This is also the promise we made when we signed the Pledge on Political Representation of Roma Women at the 6th International Roma Women conference in Strasbourg last year – as the only political party present from Finland. What I can say, is that we are fully committed to our vision. We are committed to do the work for a more equal society where everyone’s voice is being heard. And I do hope that we will soon be able to say that we are very relevant to minorities and roma women. That we do more than anyone. And that hopefully we can do this with some actual political power, that comes from having seats in the parliament. If we had those seats in the parliament, how then would the Feminist party advance the rights of the roma people? To begin with, we need to acknowledge the challenges that roma people have encountered in Finnish society in their everyday life throughout the history. Roma people have lived in Finland from at least the 16th century. From the beginning, roma people have been perceived as “vagabonds”, thus labelling the group as a whole as “outsiders”. Naming someone as the “Other” is a powerful tool when reinforcing the hierarchies of the societal structures in which some people are more privileged than others. In addition, the discrimination was reinforced by the second world war. Large areas of Carelia were handed over to the Soviet Union after the war. A majority of the Finnish roma happened to live in those areas, but their resettlement in other parts of Finland was not conducted succesfully. The source of livelihood of the roma people was based on trade, and the basis for the business thus vanished. On the new regions, they were left with nothing, and the reception was not good neither. Furthermore, after the evacuation process, the needs of the roma people were forgotten. Thus, the “vagabond” label strengthened. The way in which Finland has dealt with this issue has been an attempt at cultural assimilation. And this attitude has certainly left its mark in our society until today. Whenever I write anything regarding the rights of roma people, be it in the context of Europe or Finland, I receive racist feedback – but this feedback is so openly racist it reads as if that was the norm. That it would be okay to say these things about the roma, when the same person would not necessarily say those things about anyone else. First of all, to further the situation of the roma people means that the roma need to be themselves involved in any and all decision-making regarding the roma question. Second, building trust entails acknowledging the history and the consequences of earlier actions. I believe that Europe is in need of a truth and reconciliation process with its roma population. Third, though we must aim for diversity in representation in political institutions, representation as such is not enough. We need to talk about inclusion: to have the roma themselves be the ones making the decisions, not just being asked to represent. Inclusion is about finding answers to how to make space for true diversity without demanding assimilation. The Feminist party is committed to these goals, and to seeking answers to this and other questions together with the groups of people whose issues are at stake. Because politics – as well as the political parties – have to be genuinely open and inclusive if we want to enhance democracy. There is now a feminist political party not just in Sweden and Finland, but also in Norway, Denmark and Spain. There are seeds for a party growing in several countries. The feminist political movement has power, because it is answering to the need of many voters to place themselves not only on the traditional left-right political spectrum, but also on the liberal-authoritarian spectrum, or as we call it – feminist-nationalist -spectrum – that seems more relevant than ever in the modern society. New political parties like the feminists and the greens are movements for today. The feminist political movement answers to the need of many to be heard and to be seen and to finally be represented in the political decision-making. It can be called identity politics in a sense that these are the identities and bodies that have long been spoken over and left out from the political decision-making: women, LGBTI people, racialized minorities, immigrants, those who do not fit the norm and those who do not look like the majority of the world leaders. But I cannot conclude today without making a remark about another political movement that threatens these same groups of people. In the recent years we have seen a rise of nationalism and racism all over the world. In Europe, in the United States, and in Russia. The widely shared notion of the universal human rights as a basis for any democratic society is being shaken and slowly taken apart, even abandoned. Rise of authoritarian rule and nationalism has historically been and is always linked to the limitation of rights of women, LGBTI people, immigrants and other minorities. These already underrepresented groups of people are made the enemy of the populist movement. In an authoritarian state the many-sided and complex social problems are dealt with stricter laws and more control – as if human life, and our need for liberty and meaningful life, could ever be controlled that way. The nationalist populist movement, is also an identitarian movement. It is a movement to protect the identities and bodies that used to have all the power, but feel lost in the modern society that no longer gives similar respect for their labour or to the traditional values that they still believe in, and that no longer values certain skin color over another. Because of this movement, aggression towards different minorities has increased and more and more people feel intimidated and scared about what is still to come. We know all too well from history, that the limitations to the rights of women always go hand in hand with limitations to the rights of minorities. This is because neither women nor minorities are really taking part in the decision-making. And the more vulnerable you are, the more your rights mean to you. Unless we learn from our history, we are doomed to repeat the same mistakes. We must not let the progress in the rights of the roma people and the rights of women, nor the rights of any minority or a group of people in a vulnerable position, to be weakened, because we did not pay attention. Today, we need to pay attention. In the upcoming European elections, we need to pay attention. We must not let the nationalist movement take hold of the European Union. In crossroads like this, we must have courage to stand up for what we believe in. When someone chooses hate, we must choose love. When someone demands closed borders, we must demand to put people first. When someone faces discrimination, we must unite with open hearts and minds to stand with those who are directly threatened by the restrictions and darkness in our societies. Our minds should not be limited by what seems possible now. We must aim further, to the future where a more liberal, open and equal society is possible. And it is not only a question about the political movement and organizing oneself in political parties. Anyone should be able to take part with whatever means they have. We owe it to the earlier generations to go forward and to build a better society. What are our dreams, hopes and aspirations for the future? How could we build on that? Together we can dream of a society that aims for freedom, freedom that is supported by love – love for each other and love for this world we are living in. It would be a society where no-one is pushed to the margins and where solidarity towards others replaces the hierarchies of today.